The Altec-Lansing Valencia 846B is an American audio classic that inspired the development of the legendary Model 19. It shares many similarities with the newer and larger Model 19. There were two versions of the Valencia: the 846A and 846B. For our testing purposes we chose the 846B due to its impedance, and that it was a tuned port enclosure. We had two goals with our Valencias: 1. Make them perform like a Model 19 and 2. Make them outperform a Model 19. 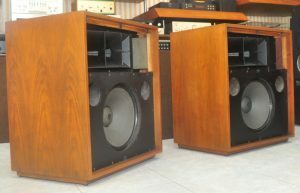 Many Altec Model 19 fans will immediately point-out the differences between these two loudspeaker system, and claim that it’s not possible to make a Valencia perform like a Model 19. After reading this article they may have to re-think what they thought was impossible. As is usually the case with vintage speakers, our Valencias needed a little TLC. We sent them over to Pax Innovation for restoration, and a few modifications that made them more acceptable for our testing purposes. A few weeks later they came back looking as if they had just left the Altec factory. Their dividing networks had been replaced with bi-amp plates with five-way binding posts, and they were stuffed with Polyfil. Pax Innovation also switched-out the Altec 806-8A drivers with Altec 902-8Bs. The extra Polyfil allowed the Valencia’s 416-8B woofer to go much lower than had been possible with the original wool. The 902-8B high frequency driver with Tangerine phase plug improved the high frequency output of the the 811-B horn. These two modest upgrades brought the Valencia into striking distance of the Model 19. Both the Valencia and Model 19 suffer from their original dividing networks, which crossed at 800 Hz and 1.2 kHz respectively. While the Model 19 has a much improved dividing network, when compared with that used in the Valencia. This is why we chose to bi-amp the system using the dbx DriveRack PA2 loudspeaker management system. Time and again the DriveRack has proven its ability to drastically improve every system we’ve tested with it. The Valencia’s and Model 19’s were raised so that the horn was just slightly below ear level, and then tilted back about 4 degrees. The front of the cabinets were 40″ from the rear wall, and >36″ from any side wall. We began our testing of the Valencia’s with the DriveRack set to 12db Linkwitz-Riley filters at 1.2 kHz. We chose this frequency because it is the same as the stock Model 19. After several days of listening tests it was determined that 12db Butterworth filters at 1.35 kHz rendered the best overall tonal quality, while almost seamlessly blending the horn and woofer into one. The Model 19’s were adjusted using their passive Altec network controls. In this configuration the Valencia’s and Model 19’s sounded very similar with the Valencia’s being the winner by a small margin. Next we decided to off-load the heavy lifting in both systems over to a pair of JBL studio subs, effectively creating three-way systems crossed at 80 Hz and 1.2kHz (Model 19) / 1.35kHz (Valencia). This allowed the 416-8B woofers to focus more of their efforts on the low and high mid-range. Both systems improved modestly from this subtle refinement. Since the Valencia’s were bi-amped, we corrected the time alignment for their individual drivers and the subs using the DriveRack. The Model 19’s were time aligned with the subs only. At this point the Valencia’s were markedly better than the Model 19’s. The final step in our testing was to apply room correction to the Valencia’s via the DriveRack. Not surprisingly, the Valencia’s outperformed the Model 19’s in every way. Just to see how far we could push things, the original 902-8B drivers were switched-out for a pair of our hot-rodded 902’s . (Yes, we will be telling you about how to do that in a future article.) This put the highest frequencies well out of reach of the Model 19’s. As can be fairly pointed-out, our tests were rigged from the beginning. The Valencia’s were afforded multiple technological advances over the Model 19’s. The results were predictable before we even began. 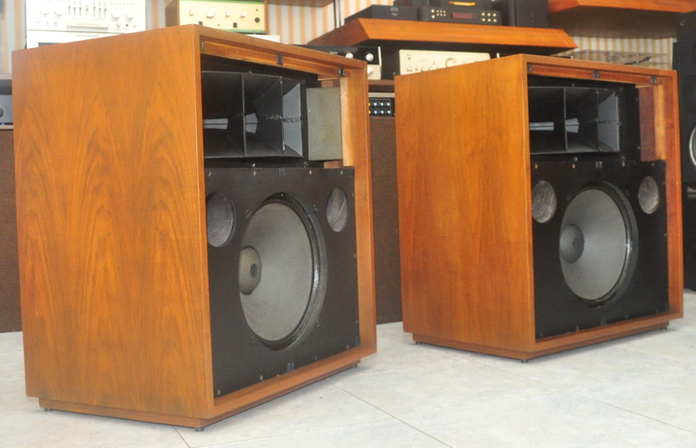 We even setup a pair of Altec Santiago’s in the same way we had the Valencia’s, and they too bested the 19’s. So what did these experiments prove? Was the Model 19 knocked off it’s celestial pedestal? Are the Valencia and Santiago better speaker systems? No. All of these vintage systems remain excellent, even by today’s standards, but all can be pushed to sound even better with the use of modern technology. All three systems can be made to sound such that they are indistinguishable from one another. If you own one of these speaker systems it can be significantly improved with just a few modest upgrades.